Over the last few months I’ve been doing a lot of thinking, talking (mainly ranting) and philosophising about the role of PE & school sport outside of promoting healthy, active lifestyles. It seem to now be commonly accepted by the masses that physical activity is “good for you”. The government’s media campaigns, however misinformed/misdirected they are, do seem to have been assimilated into the psyche of the general public. I swear there are more joggers (or is it “Yoggers? I’m not sure if it has a soft J”) on the seafront and more people using the gym after 5 at our school. This can only be a good thing and I’m happy about the contribution that understated and often unrecognised PE/school sport has made. As we constantly remind the kids however, PE isn’t just about getting better at sport. For me, the values, morals and life skills encouraged by PE and sport are invaluable and aren’t always evident elsewhere in school or society. Last week a kid came to Dodgeball club, a newly formed lunchtime recreational activity for our Yr7 & 8’s. About 2 minutes in, he took a shot to the left leg. He stopped, looked around, picked up the ball and carried on playing. Now you might question whether he knew the rules of the game (to be fair, I might have quickly gone over the rules & he might not have heard them), he might have thought that the ball had bounced, or he might have not have felt the contact. I caught his eye and gave him the international gesture for “you’re out lad”, at which point he exploded with rage and shouted “I’m not f***ing out! It never hit me!” Now I am getting on a bit. My eyes aren’t what they used to be, but I had no doubt as to what had happened. He was cheating and he knew he’d been caught. The lad stormed over to the side of the room, kicked over a bench, the proceeded to punch the wall and give me the “right, you’re going on my secret kill-list” stare. I’m old school. I threw him out. Should I have calmly tried to diffuse the situation? Yes, probably. I should have used some of the tactics I shared with our ITT students during a behaviour management session last week, but I didn’t. I caught up with the lad the next day. He was very apologetic. I apologised for throwing him out without trying to resolve his obvious grievance. He’s a decent kid. Why then did he lose the plot so aggressively & unnecessarily? Cue lengthy discussion (rant) with wife. I am a big fan of role models. I had some corkers. Steve Cooksey, Gary Cooper, Eric Sampson, Ian Evans, Dave Ridley and the late, great Steve Creek. Along with most of the nation, I accumulated more this Summer in Mo Farah, Katherine Grainger, David Weir & Ellie Simmonds. When I talk to kids about inspirational people, it’s usually someone from sport that springs to mind. Lately though, we seem to be swamped with negativity in the form of false sporting idols. The biggie for me is Lance. I was a huge fan of his during his cycling career. I read his books. I love the charity work he does. Simply for not dying and coming back from the brink, I still respect him. But after USADA finally published the findings of their investigations, I simply couldn’t hold up Lance Armstrong as a role model any longer. “Win at all costs” isn’t a sentiment with which I feel affinity. I have been lucky most of my life to feel that I am good enough to be satisfied. Am I the best at sport? No, that’s why I’m teaching PE instead of playing for YCCC or the Rhinos. Am I an outstanding teacher? No, but I think I do my job well and the kids get good value. I could go on. I try and help kids realise that they need to be the best they can be, but nobody should insist they are “the best”. It’s unrealistic; as Highlander said “there can be only one”. The John Terry/Luis Suarez/football racism fiascos. I cannot understand how, in 2012, we’re still dealing with issues around racism. It is senseless. What upset me most about these cases was the stance by the clubs and their supporters in backing the players accused. I’m all for “solidarity brother” but unfortunately the public show of support backfired hugely. Fans were abusing Anton Ferdinand & Patrice Evra via social media, death threats were reportedly received at the QPR training ground and the FA were impotently useless in their attempts to convince the watching world that their respect campaign was working. How would a school have dealt with claims such as this? Full investigation, parents brought in for a meeting, major consequences should the accused be found guilty. These things simply didn’t happen. Suarez was banned for 8 games, Terry for 4. Basically, the FA’s decision reflected that put together, two counts of public racist abuse is just about as bad as Paulo Di Canio pushing a referee over. My view is simple; an ugly problem from the dark days of football resurfaced, it should have been swiftly and surely destroyed with massive sanctions. The point being, not only are John Terry and Luis Suarez role models, so are the FA. They all acted badly and as a result our kids are exposed to the worst kind of negative publicity. I used to be a massive football fan. Recently however, I’ve become more disenchanted by the day with the professional game. Kids all over the world dream of becoming a footballer. I read an excellent interview with Reading captain Jobi McAnuff in which he describes meeting with local 8 year olds. The first two questions he was asked were; “what car do you drive?” and “how much do you get paid?” What a ridiculous state of affairs when the two things kids associate with footballers are cars and cash. I look at the amount of “simulation” that goes on in matches. Let’s call a spade a spade, it’s cheating. It’s accepted in the game. It isn’t punished. Every now and then someone gets a yellow card, but it’s accepted. If a kid dived in a school football match and faked injury, I’d drag his arse off & put someone on who wanted to play, acting’s for the drama lot. I watched a game last week in which a linesman awarded a throw-in against a defender trying to keep the ball in play. He rushed towards the official and launched a tirade of abuse, it was clear that the outburst started with “F*** off!” What happened? Nothing. The official in question stared blankly ahead, like the driver who cuts you up then ashamedly pulls up alongside you a mile down the road at the roundabout. Again, what would I do if that happened in a school game? The kid would certainly not play any further part in that game & probably any others for letting the school down so badly. Again though, sanctions are applied rigidly in schools, why not in a situation where the stakes are higher & the publicity greater? Ashley Cole. The man gets his own section. A mercurial talent, of that there is no doubt. As a purely athletic role model, he is great. However, Mr Cole unfortunately seems to court controversy as a hobby. His latest faux pas resulted in him calling his governing body a “bunch of tw**s”. Had I publicly said about my headteacher & governors, I’d have been sacked on the spot – probably never to work in education again. Lots of our kids saw the offending tweet, lots of them talked about the incident in school that week. All of them saw Ashley Cole’s inclusion in the England squad only days later. I accept that an official apology was made. I also doubt very much that Mr Cole had the gumption or remorse to make such an apology without the heavy encouragement of his management firm. Apology or not, there was simply no punishment. Good message to kids? As long as you say sorry, you’ll get away with it. Sport is a massive part of my school. The badge on the kids’ chests mean a lot to me. Representing that badge is more than just being a good player or a good performer. It’s about being made of “the right stuff”. Out-of-date sentiment? Possibly, but if we’re not instilling the values of respect, fair play and honesty, then who is? As teachers, coaches and role models ourselves, we need to ensure that what we preach is the right message & kids understand it. We need to encourage kids to look towards the Brownlees, the Johnny Peacocks and the Jess Ennises rather than towards the more obvious, glamorous and the misleading. We do that and we’ve cracked it. At our school, staff are given the opportunity to join a Professional Enquiry Group (PEG) as part of our Wednesday afternoon CPD slot. The “PEGs” have been around for a couple of years now at CLV but I must admit that I honestly just did not buy into the idea first time round. Too many buzzwords, too many bullsh***ers. (Blue sky thinking, looking through lenses, driving, scaffolding, unpacking etc). However, fast forward to this current year and I have genuinely developed an interest in the area of differentiation – particularly in relation to PE controlled assessment. I decided to use this interest as the focus for my new Professional Enquiry. I presented my PEG last week to staff who were unfortunate enough to sign up to my session… Including the boss. Our exam board is OCR and I must admit I was glad when they scrapped the old coursework because it was crap. We were constantly chasing bits of missing work; with lots of kids, it was simply a last minute job which meant nothing to them. Cue the introduction of Controlled Assessment – both B452 & B454 units. The first is an “Analysing Lifestyle” assignment, requiring kids to compile data about a chosen individual (usually someone who isn’t that healthy, so they’ve plenty to write about) and then make sense of this data through written evaluation & recommendations. My kids bombed. Despite a couple of what I thought were thorough preparation lessons & adequate time to collect data and then write-up; results were poor. It was obvious that the kids simply had not fully understood what needed to be written into the assignment. Lots of these students were the kind who, in the past, would have generated masses of pages of detailed coursework; but when faced with 2 hours of unprompted writing, they bombed. I re-read the rules regarding controlled assessment and made sure I wasn’t about to break any major laws by altering the way in which I introduced the next assignment. We’d had some exemplar work sent back from the moderator from the previous year – which included a 20/20 piece. There is nothing to suggest that pupils should not be shown examples of good quality work during the preparation phase of the controlled assessment process – so that’s what I based my project on. I split the assignment into 22 sub-sections and then found the relevant bits in the “perfect” assignment we’d got from the moderator. I photographed each relevant snippet from the assignment and blew up the paragraph of text onto A3 paper, together with a number corresponding with relevant part of the assignment. These A3 sheets were then positioned round the outside of the room. 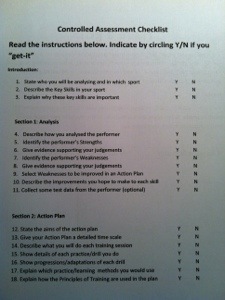 The kids were each given a checklist which included a Y/N indication for each of the 22 key areas of the assignment. 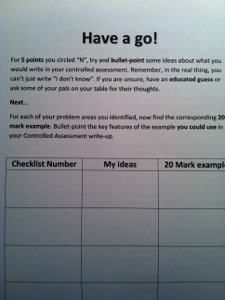 Pupils indicated whether or not they “got it” on the checklist before moving on. After attempting this activity, the kids were released from their desks to go and actively find the key information/examples from the 20 mark snippet sheets around the room. The kids seemed to enjoy this. They didn’t simply go straight for the “right answer”, nor did they blindly copy down an exemplar quote, but rather they asked one another about what they had written, they found others with similar weaknesses in their understanding and attempted to solve problems themselves. The activity didn’t rely on me telling the kids what to do next, they were finding out and theorising for themselves. Above all, the activity felt like the kids were doing it themselves – rather than me simply telling them what they should be doing. After all, differentiation for me is all about allowing the pupils to access the material for themselves and find out what it is they know and don’t know. The table below shows the raw marks for the 22 students in my group. 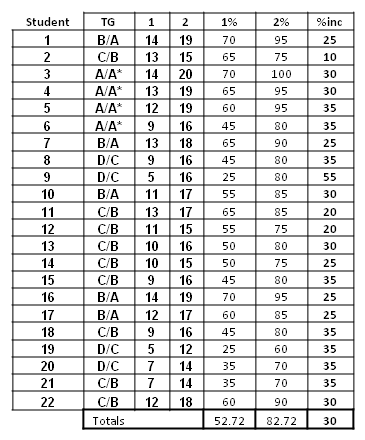 Columns 1 and 2 show the mark/20 followed by % grades for each piece of work. As you can see from the table, the group’s average % score for the 1st Controlled Assessment was a tad over 52%. The average for the 2nd Controlled Assessment, following this lesson was over 82%. An average increase of 30% per student is not to be sniffed at. I’ll not try and claim that it was all down to this style of delivery – CA2 is generally accepted as being a bit easier to engage with, but still, the results were excellent. For the last few weeks, I’ve been making use of an app called “Coach’s Eye”. This app created by TechSmith is available for download currently priced at £2.99 from Apple’s App Store. I believe it’s also recently made it onto the Android platform but, not being a user, I don’t know much more about this. The idea is a simple one; teachers/coaches can use video analysis software to provide either instant visual/verbal feedback to students, or fiddle with video clips to add graphics and more in depth analysis to the visuals. For me personally, Coach’s Eye means that you can honestly make use of technology in just about every practical lesson imaginable. For too long, PE departments have been peddled expensive, elaborate technology & software like Kandle or Dartfish to name but two. Now I’m not going to bash these bits of tech; they are sophisticated, innovative and can allow experienced users to perform all kinds of wizardry to wow and engage even the most sceptical of audiences. However, if like me you work for a living & don’t usually have a spare few hours to spend creating, tweaking and computer-screen-staring, you might never make it past the most basic functions of the programmes. I used Kandle for the 1st time in my previous school, 7 years ago. The only thing it ever got used for was the time-delay playback function. This allowed kids to see what they had just done on a projector screen and hopefully then evaluate/improve their performance. This for some reason was always in gymnastics. Unfortunately setting up a video camera, projector, screen, laptop & cables was a right pain in the arse. And the £2000 cost for the full Kandle package didn’t really seem justified. Now compare that to Coach’s Eye. The App is £2.99. It allows users to capture video or import existing footage from the camera roll. Once captured, the footage can be slowed, paused and with the use of the jog-wheel function, rolled on frame by frame. You can record audio commentary onto the footage for verbal feedback and also draw graphics directly onto the visuals on screen. It’s a bit like a poor-man’s Alan Hansen-esque analysis diagram. The finished analysis video can be uploaded to YouTube, sent via email or Twitter all via the inbuilt “share” function. The whole process can be as quick as 2 minutes; great if you are wanting to show kids what they are doing in a lesson/game/skills practice. I’ve started taking a pair of headphones to plug into my iphone so that kids can clearly hear the commentary – it can be a bit quiet when played on a windy field. You can take your time with Coach’s Eye and create more complex analyses, but for me, this kind of goes against the beauty & simplicity of the software. It isn’t designed to be that expensive bit of kit that gets wheeled out when Ofsted come sniffing. It’s real day-to-day useful technology. The way I’m using Coach’s Eye is pretty much Teacher-driven. Some institutions may have invested in iPads or other generic tablet devices en masse. At Cramlington we operate a scheme whereby all students in Years 7 & 8 have opportunity to obtain a Samsung Galaxy Tablet. This kind of mass usage would allow kids to create their own Coach’s Eye analysis videos & share them with others in the group. Not something we’ve looked at yet but a distinct possibility in the near future. We also employ a fantastic team of web designers who create apps & programmes in-house; I might ask them to look into creating a similar (non-Copywrite-infringing) programme for our kids to download and use. For now, I’m still learning. I’ve included a link to an early attempt at using C.E. in a badminton lesson. The audio was recorded post lesson – the original commentary for the lads involved was pretty crap to be honest. Enjoy.